-Tough loss for the Friars, but it will be beneficial for the younger guys on the team. Pittsburgh showed how you fight off a comeback and win a close game. They never panicked. They stuck to their game plan. They left the Dunk with a win. -Is Kris Dunn the reincarnation of Michael Jordan? If January 22, 2013 going to be remembered as the night of the “Flu game” against Pitt. You have the announcers saying that they have received word that Dunn is out for the game due to flu like symptoms before the half. Then, after halftime they put the camera on Dunn and it looks like he’s going to hurl into his jersey. Finally, with a minute left Dunn checks into the game for a defensive stop (a possession where he subsequently got torched en route to a Pitt score). If anything, Dunn is a warrior. – LaDontae Henton is terrible. I can’t elaborate much more. He finally hits a 3-point shot after about 37 consecutive misses, Tim Welsch starts going on and on about how that will break the streak and he’ll get going again. How does Henton answer? With a couple more bricks. Well done LaDontae, well done. The dude is useless. His nickname should officially be changed from “Buckets” to “Bucketless”. 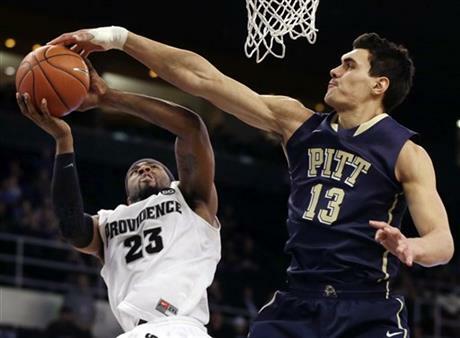 -Pitt averages 9.8 turnovers a game and the Friars forced 13. Not a huge difference from their average, but that shows a huge change in a team that used to play absolutely NO defense. Dunn starts their defensive pressure, and the whole team picks it up behind him. -With that being said, Pitt shot 51% from the floor. That number is unacceptable. Numerous times there would be a lot of pressure on the ball for the first 25 seconds of the shot clock and then Pitt would come away with an uncontested layup. I’m not sure if it was a rotational problem underneath or if there were some communication errors. Either way, coach Cooley needs to get it straightened out. -Kadeem Batts is essentially the antithesis of the soft, stupid player that used to take the court for the Friars. This kid battles. He’s usually outsized and double teamed, but it doesn’t seem to matter. Kadeem has been arguably the most consistent Friar over the course of the season and I commend him for that. Cooley and his staff have done a wonderful job developing Batts, but the kid deserves some credit too. -Vincent Council in the 2nd half is the Vincent Council that needs to play 35 minutes a game. If not, we will struggle to win a close game all year. -Josh Fortune’s defense is the only thing keeping him on the floor. Offensively, he does more bad than he does good. I can’t count the number of times I’ve had my head in my hands cursing Fortune. Whether it’s a kicked ball out of bounds, a bad pass, or just a stupid play. Fortune needs to find a way to limit his mistakes. -Refereeing in the Big East needs to be improved…drastically.